This is the site of Francis B. "Frank" Bonifay's law office. 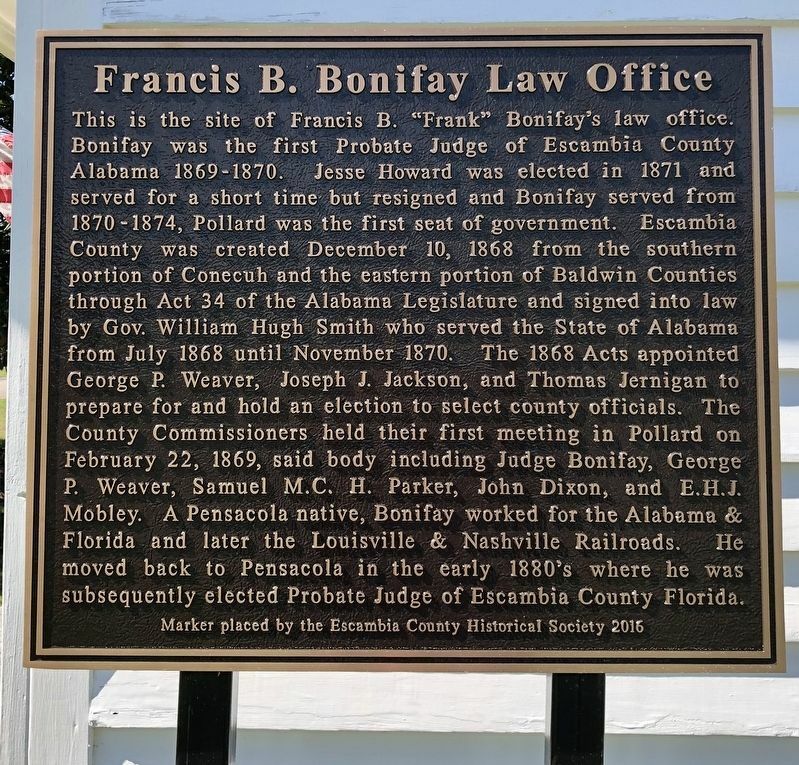 Bonifay was the first Probate Judge of Escambia County Alabama 1869 - 1870. Jesse Howard was elected in 1871 and served for a short time but resigned and Bonifay served from 1870 - 1874. Pollard was the first seat of government. Escambia County was created December 10, 1868 from the southern portion of Conecuh and the eastern portion of Baldwin Counties through Act 34 of the Alabama Legislature and signed into law by Gov. William Hugh Smith who served the State of Alabama from July 1868 until November 1870. The 1868 Acts appointed George P. Weaver, Joseph J. Jackson, and Thomas Jernigan to prepare for and hold an election to select county officials. 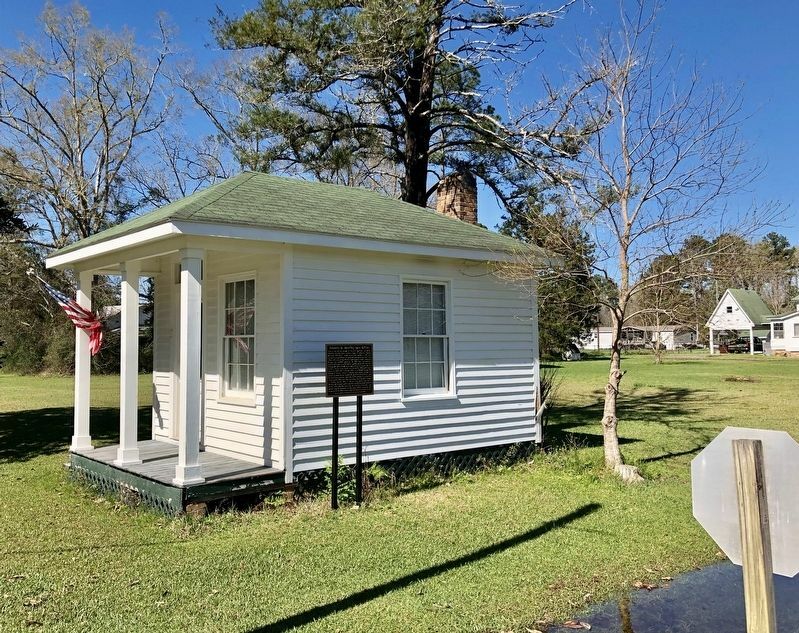 The County Commissioners held their first meeting in Pollard on February 22, 1869, said body including Judge Bonifay, George P. Weaver, Samuel M.C. H. Parker, John Dixon, and E. H. J. Mobley. A Pensacola native, Bonifay worked for the Alabama & Florida and later the Louisville & Nashville Railroads. He moved back to Pensacola in the early 1880's where he was subsequently elected Probate Judge of Escambia County Florida. 2016 by the Escambia County Historical Society. Location. 31° 1.609′ N, 87° 10.358′ W. Marker is in Pollard, Alabama, in Escambia County. Marker is at the intersection of Manassas Street and Misella Street on Manassas Street. Touch for map. Marker is in this post office area: Flomaton AL 36441, United States of America. Touch for directions. Other nearby markers. At least 8 other markers are within 7 miles of this marker, measured as the crow flies. The Lindsey-Fitzgerald House (about 300 feet away, measured in a direct line); Pollard Methodist Church (about 400 feet away); Pollard Station (about 500 feet away); Site of Pollard (approx. 1.4 miles away); Southern Pine Electric Membership Corporation (approx. 5.2 miles away); Alabama's Own (approx. 5.6 miles away); Flomaton, Alabama (approx. 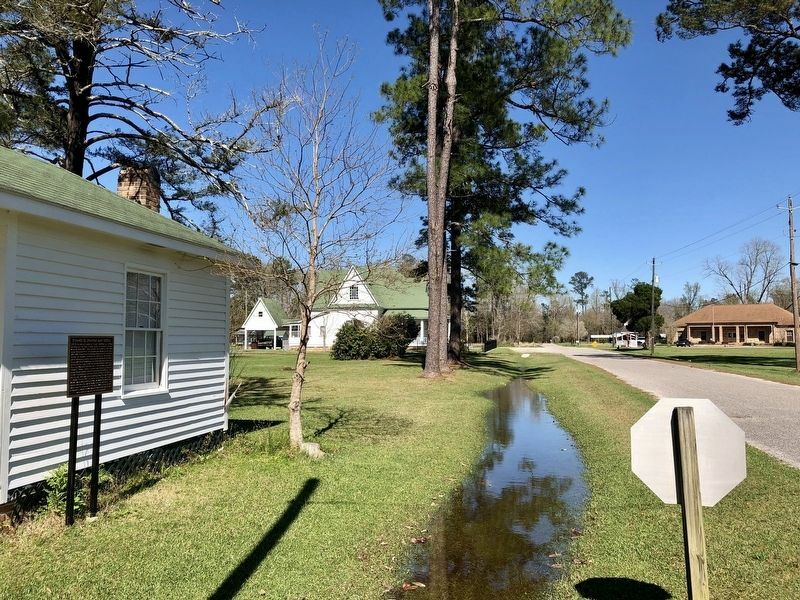 5.6 miles away); Alger-Sullivan Lumber Company Residential Historic District (approx. 6½ miles away in Florida). Touch for a list and map of all markers in Pollard. 3. The view NNE on Manassas Street. More. Search the internet for Francis B. Bonifay Law Office. Credits. This page was last revised on March 7, 2019. This page originally submitted on March 7, 2019, by Mark Hilton of Montgomery, Alabama. This page has been viewed 50 times since then. Photos: 1, 2, 3. submitted on March 7, 2019, by Mark Hilton of Montgomery, Alabama.